Your little gardener will have fun with Little Tikes garden toys. LoveToKnow (LTK) presents a review of the Little Tikes Gardening toys. LTK Toys received free review copies of the Little Tikes Garden Tool Set, Little Tikes Garden Grow Watering Can and the Little Tikes Garden Bubble Leaf and Lawn Blower from the Imperial Toy Corporation. An LTK staff member and her five-year-old daughter tried out the products to find out what these toys offer kids. 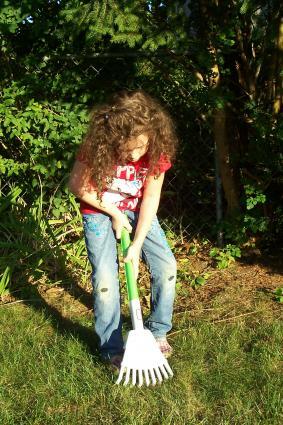 The Little Tikes Garden Tool Set, manufacturer suggested retail price (MSRP) at $12.99, is a rake and shovel set. The rake and shovel are made out of a thick plastic in green and white. Each tool is made all in one piece, but the two-toned colors give the appearance of a toy with multiple parts. The tools at 24" in length are a good size for toddlers through preschool age kids. The tools are made of a thick but lightweight plastic that's strong enough to withstand rough play. The child reviewer shoveled and raked with the items, but also banged and threw them around to test them out. The one-piece design makes the toys more durable than similar competitor products that contain two or more pieces, which can come apart over time. 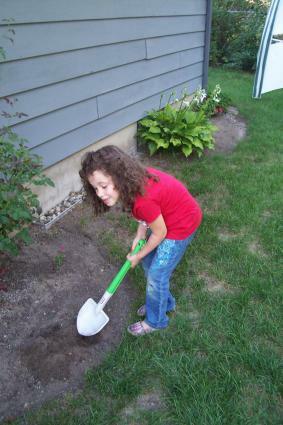 The five year-old reviewer was able to easily hold onto the handles, even when actively shoveling or raking. The edges of each tool were smooth with no sharp edges. The only negative about the product was the price. The MSRP of $12.99 seems rather expensive, and on some websites like Amazon, the products sold for twice as much during summer months. Generic brands and some competitor products cost less than $12.99, or offer bundles of other gardening toys for that price. Watch for sales at local stores and you may find the toy set for close to the MSRP or less. This rake has child-safe smooth edges. The can is made of a durable plastic that was able to withstand the five year-old reviewer throwing it onto the cement driveway without any damage. The toy is mainly one-piece with the only separate piece being the adjustable nozzle, which is securely attached to the spout. The watering can holds enough water to water a number of plants. 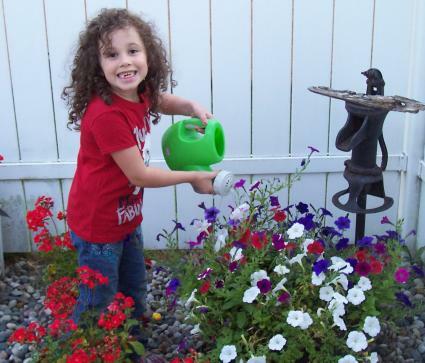 The child reviewer enjoyed helping her mom water the plants with a watering can that was her size. The adjustable nozzle changes water direction as described on the package label. The five year-old reviewer liked using the water can to simply play with water by creating different water streams with the nozzle. The Little Tikes watering can is more durable than some competitor models that feature thinner plastics. The multiple stream nozzle will appeal to many kids. Little Tikes Bubble Leaf Blower generates a lot of bubbles. The Little Tikes Garden Bubble Leaf and Lawn Blower (MSRP - $19.99) is a bubble blowing machine shaped like a leaf blower. The toy is made out of a sturdy plastic in green, white and yellow. The product comes with an 8-oz bottle of Little Tikes bubble solution. It operates with 2-AA batteries. To begin play, you first must pour a small amount of bubble solution into a lidded compartment on the front of the toy. You then turn the machine on and push the lever to get it to trigger the bubble production. The crank is more decorative and didn't appear to enhance the bubble production. The child reviewer noted that it took a few minutes for the toy to warm up and produce bubbles. Once the toy started making bubbles, it created continuous streams of bubbles that kept growing as she pushed the lever. When you start to get low on solution, the toy will start to make fewer bubbles. The toy goes through a lot of bubble solution during each play session. The bubble chamber leaks if you tip it over when filled. In fact, one Toys R Us reviewer noted that the bubble chamber leaked into the battery compartment, created rust and the toy stopped working. 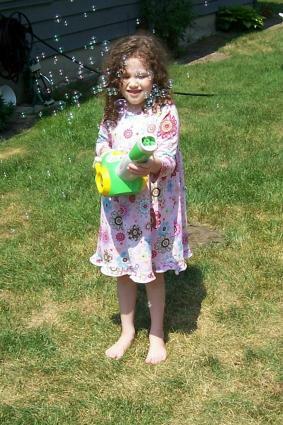 Overall, the child reviewer enjoyed playing with the toy and found it to be a fun way to create bubbles. Little Tikes gardening toys are worth considering when you are looking for garden-themed toys for young children. The well-made toys are durable and should hold up to rough play in the outdoors. They are safe and age-appropriate for kids as young as two years-old. The Little Tikes brand name makes the products a bit more expensive than lesser known brands. However, parents may be willing to pay a little extra for a quality toy that will last.